DESCRIPTION: The huge new titanosaur Futalognkosaurus dukei in its natural habitat. It's a somewhat misty day in Argentina, about 90 million years ago. 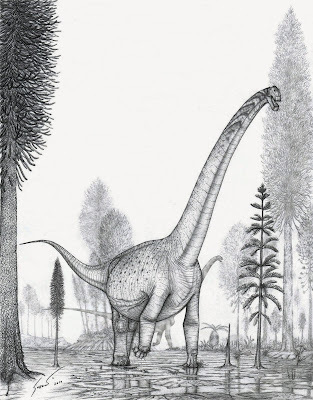 Futalognkosaurus ("Giant Chief Lizard") is known from a mostly complete neck, torso, hips, and a bit of tail and limb material, making it one of the most complete giant sauropods. It was around 28m long. The neck was unusually deep, and the backbone supported a wide rib cage.